Happy Friday loves! Have you also noticed how trendy are polka dot outfits these days? This pattern is having a major moment this season. If you want to try something different this season go for a polka dot dress. Marc Jacobs said it, too: “There is never a wrong time for a polka dot”. And how can you blame him? Polka dots are a timeless classic pattern that we will never get tired of, and can be found in a lot variations. I got this beautiful polka dot dress a couple of months ago. I had so many styling ideas, but for this time, I wanted to give an edgy/tomboy twist to this feminine dress. To achieve that, I wore it with the iconic Balenciaga boots and a denim jacket. My go-to way to dress down an outfit is by adding a denim jacket. I finished with my Chanel boy bag and these cool cat-eye sunglasses. What do you think? To give you all more inspiration, check the dresses and designs of polka dots below. I have chosen the most popular and trendy styles for all budgets and tastes. These dresses feature different sizes of polka dots, some are big and some are small. You can wear both of them, as both are making a bold trend this season. Don’t forget to add accessories, as they add more charm to the entire look. My favorite style of this pattern is the dainty polka dots, like the ones on my dress or this one here. What’s your favorite? Big or small? Wow! I like your thoughts of an edgy tomboy twist to your outfit. I love the wrap over skirt detail to the dress. on yours . As for which size polka dots I love the most. Then it has to be the dainty little ones every time. I must tell you my favorites in this delightful collection. 1. Anna October one in lovely chiffon. 2.The Alice Temperley. 3. Zimmermann`s pink mini. 4. ASOS midi with gorgeous floral ruffles, oooh! 5. ASOS with lace inserts. Oh well, Marc Jacobs was SO right! I am so obsessed with this current polka dot hype and you styled your dress absolutely on point my Stella! Have a wonderful Sunday! You look stunning my dear Stella! The dress is simply gorgeous, so elegant and so beautiful! Your look might be a bit edgy with these boots yet is so stylish and chic! The photos of you and Thessaloniki are always fantastic! I miss you my dear! Kisses and hugs! 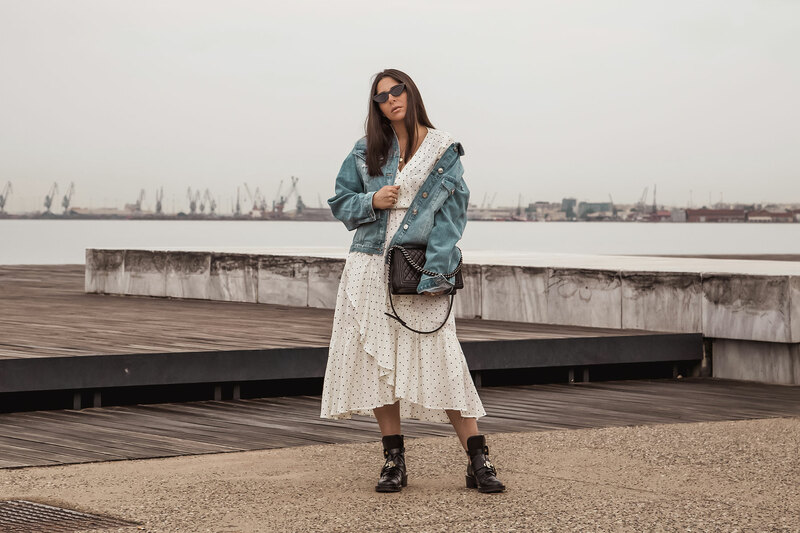 Back to fashion, I love this getup, I am all for rocking a pretty summer dress with statement boots, throw on a denim jacket and you got an effortlessly stylish summer look. Love it dear! You really can’t go wrong with this timeless print. 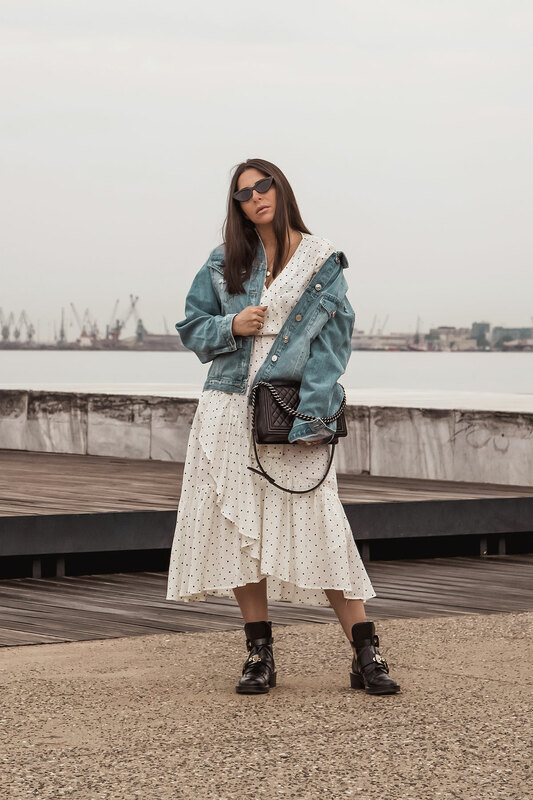 Such a classic look, edgy and sassy with the denim jacket and the boots! Oh, I love this edgy look. It is so pretty. Amazing photos and I love your outfit! I don’t think you can ever go wrong with polka dots!! I hope you are enjoying you best time with you little Angel, he is so adorable God bless his soul. Omg I love too many polka dresses you added. Thanks for this lovely selection. Already getting my credit cards ready. I love polka dots but as for me I try to be careful with using ultra feminin prints to avoid an sweet doll image. That’s why I can imagine to wear polka dots together with items in opposite styles. Your edgy outfit is exactly what I love. Your Balenciaga shoes & denim jacket are the best choice! Love the outfit!